Your Design is complete and now it’s time to start building your Agua Pool in your Ormond Beach home! Our office staff will work behind the scenes to secure permits, schedule inspections, coordinate our equipment and crews, and keep you informed throughout the design and construction process. Your on-site Construction Manager will supervise each phase of construction and communicate with you throughout every stage of the process to assure quality results from design to completion. We cater to New Smyrna Beach, Daytona Beach, Ormond Beach, Palm Coast, St Augustine, and surrounding cities. Once the permits have been issued, your property will be pre-sited for construction by one of our Construction Managers. 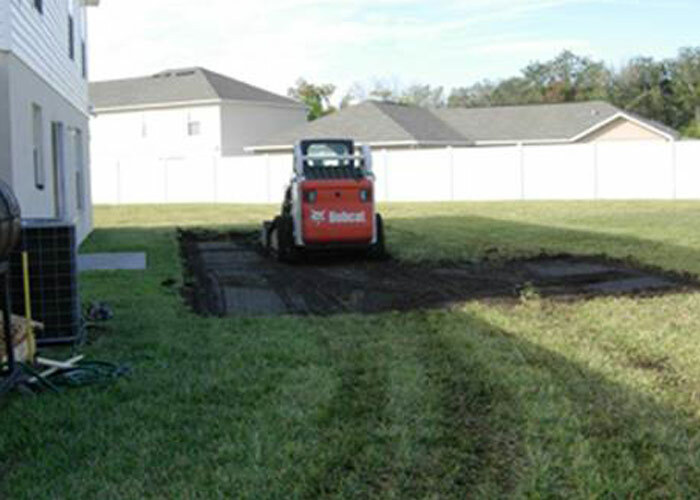 We will cap your water irrigation lines in your future pool area, and our excavator will strip the sod in the pool and deck area. The excavation process is now ready to begin. 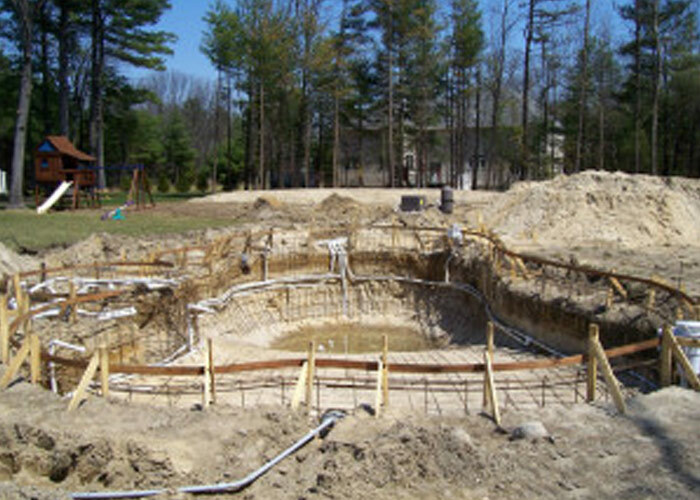 The earth from your pool is either hauled away or kept on site for backfilling as necessary for later phases of construction. This is one of the two “dirty and noisy” phases of construction. We attempt to keep the dust down to a minimum, but it will be dusty, and the heavy equipment is noisy. We suggest you keep all windows and doors closed and keep your children away from the site during this phase. PLUMBING: Schedule 40 PVC pipe, which will be beneath the deck will be installed and extended to the mechanical equipment location. This includes lines such as the main drain, skimmer, hydro-therapy jets, automatic cleaner, waterfall, and any other mechanical lines that may be included in your design. All piping is pressure tested prior to gunite placement to insure against any leaks. 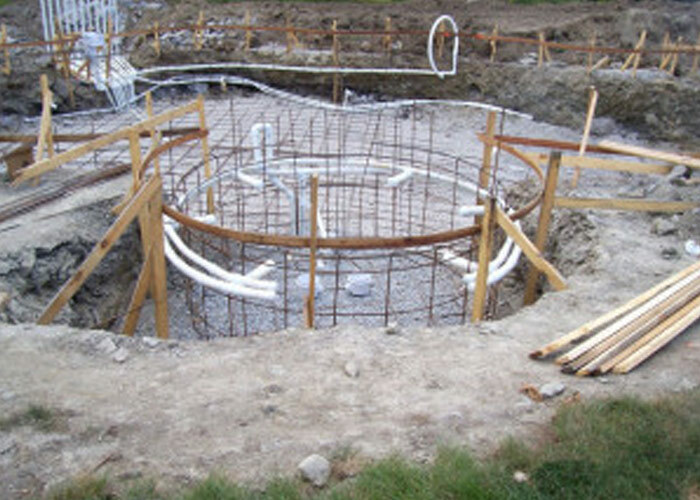 STEEL – 3/8″ steel reinforcing bars are placed to strengthen the gunite shell. 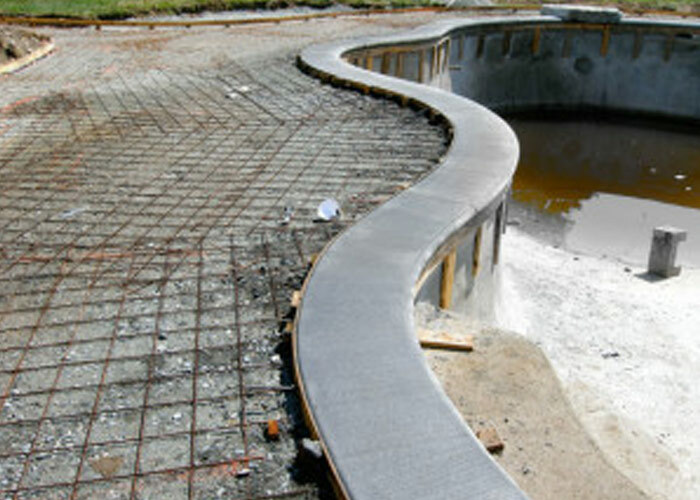 The steel is shaped to the pool’s design and extra steel is used at points of high stress. The reinforcing steel is securely tied in place. The day of guniting, the bars are blocked up from the dirt so the entire “basket” will be surrounded by gunite when finished. The electrical contractor will then bond the steel shell. 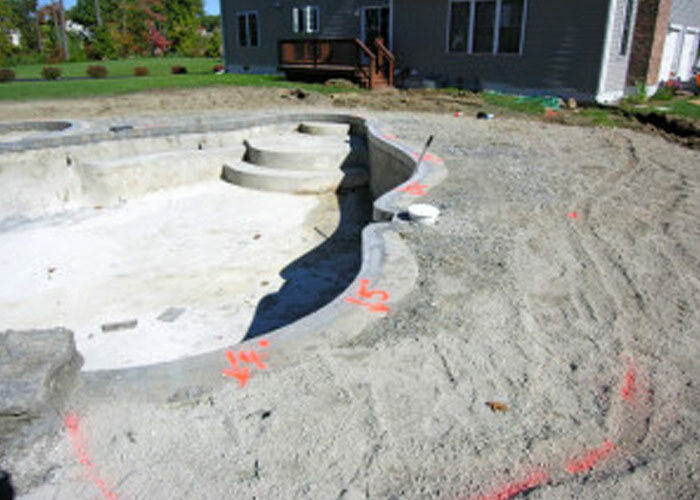 Stairs and benches in the shallow end do not have steel placed; they are solid gunite. ELECTRICAL – Our licensed electricians will inspect your service panel and determine the exact distance to the mechanical location. They will also bond the steel structure and call in your 1st inspection. INSPECTIONS – Our office staff will notify both the building and electrical departments, prior to guniting your pool. We have placed your permits in a permit box and erected it in front of your home. Please make sure the building permit box is accessible for the inspectors. If the permit box is not there, please notify us immediately. This is the major step in your construction project, one of the dirtiest and certainly the noisiest. There are many large trucks on site the day the Gunite is shot. It’s exciting to watch, but you will want to keep all nearby doors and windows closed throughout the guniting operation. During this phase the stairs, benches, lighting outlets and other features will be set in place. 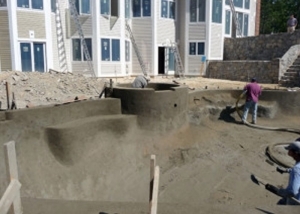 Beginning the next day, we ask that you wet down the gunite shell two twice (2) times per day for seven (7) days to facilitate the curing process. Please don’t be alarmed if any water accumulates in the bottom of the pool. During the seven (7) day curing period 85% of the concrete cure takes place, and we then resume the construction process. The forms will be stripped, any necessary backfilling performed, and preliminary deck grading will take place. During the grading process we will add any sub-base material needed for the deck area to achieve proper elevation, and all the plumbing, electrical, and gas lines will be laid out at this time. A 6″ band of ceramic tile will be applied to the top inside edge of your pool which will allow easy cleaning at the pool water line. If tile markers are to be placed on the stairs, they will be done day of plaster. Pleas make sure water and electricity are available for our crew’s use. 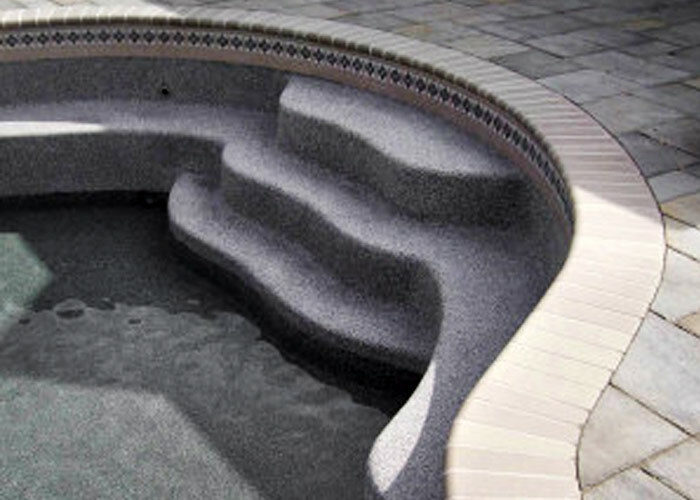 If your pool design calls for coping, field stone or other materials, our stone masons will install this finish. Otherwise, the cantilever edge of the deck will provide the pool’s top finish. If your pool has a water feature(s) don’t be alarmed if you only see a pile of rocks. The finishing touches have not been applied yet. This is a very important phase of the build as your deck will accent both your pool and your home, and at this point your pool and pool area is beginning to take shape and the project really starts to come to life. During the Deck Layout and Pour there will be large concrete trucks in and around your home, and we ask that all cars are cleared to allow access and that all children are kept out of the area. 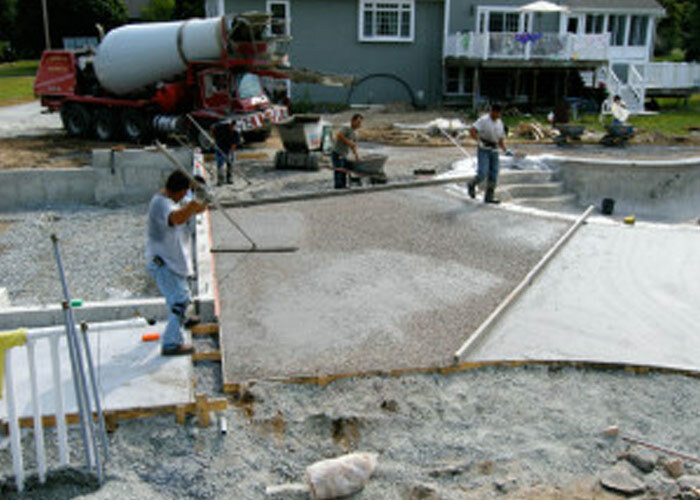 At this point your choice of decking (plain, exposed aggregate, pavers or stamped) will be installed. Some of materials are installed over several days, so please don’t be alarmed if your deck doesn’t look the right color after it is poured. We will also cut expansion joints in the stamped pattern, and you may see some hairline cracks, but the deck is reinforced with 3/8” steel rebar and this is normal. Your pool equipment, including the filter system, time clock, automatic cleaner, and heater (if ordered), will be installed and our electrician will complete the wiring of all the mechanical equipment. 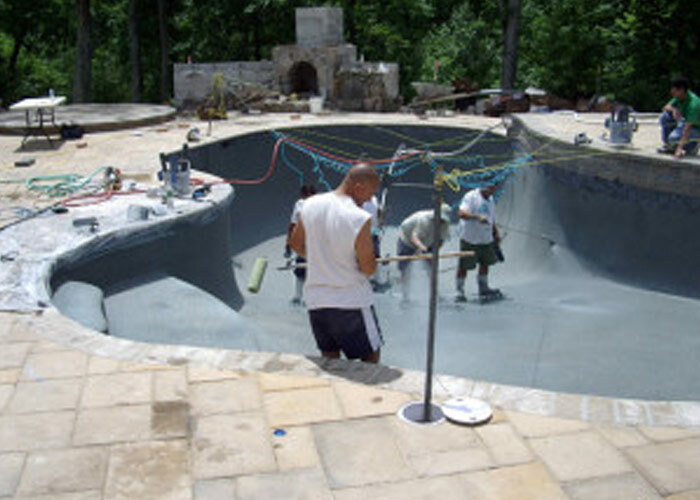 The final step will be applying the interior finish to the pool—and it is essential that the pool and surrounding area be kept as clean as possible. Please be aware that that at this time any work you or other contractors may be undertaking in the pool area which creates dirt, dust, smoke or other debris, must be completed beforehand, or postponed until later. The sparkling cleanliness of a fine quality pool depends not only upon the ability of our craftsmen, but in keeping the pool as clean as possible until it is filled. We cannot be responsible for footprints or stains caused by dirt, fertilizer, dust, and other debris from construction, landscape projects or winds. After the interior finish is applied, either your fence or temporary fence will be installed to meet both local and state codes prior to filling the pool. Once the filling operation has begun, PLEASE DO NOT turn off the water or move the hose from its original position until the level has risen to the middle of the tile band. This eliminates the possibility of a dirt ring, which is difficult to remove. When the pool is full, please turn off the water and inform us. Under normal conditions it is not necessary to call us until the pool is full. 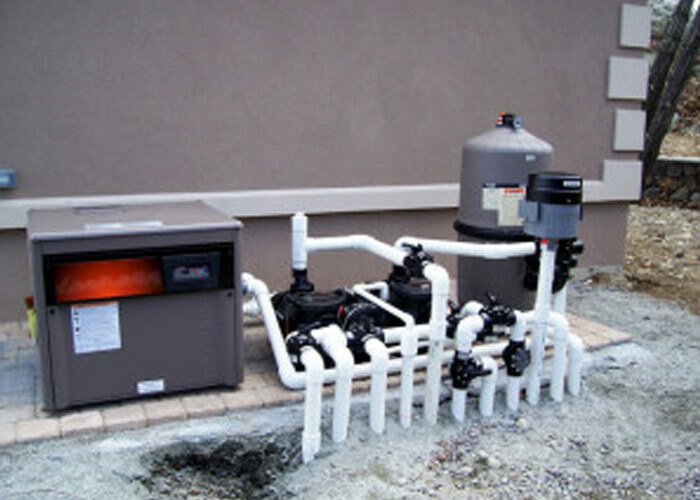 There is no harm in not having the filter on, for up to a week after filling. There is also no harm in swimming in the pool before the filter is started. Our project manager will perform a complete quality assurance check to insure everything related to your pool is perfect, AND, we will even take you to “Pool School” to learn how to operate your Agua Pool.